This morning I woke up curiously early. I usually avoid doing so like the plague because the Mister has this annoying habit of firing up NPR online in our living room and via conventional radio in the kitchen. Any of you who have done this probably know there is a delay with online audio; this phenomenon turns the confines of the 450 (if that square feet) palace we call home into one big echo chamber of current events. As I got my first cup of morning coffee I learned about David Foster Wallace committing suicide. Did you hear that Merrill Lynch is going to be bought by Bank of America? I have: once in the kitchen and again in the living room! In other news the Feds have refused to bail out Lehman Brothers. I got the why and wherefore before and after going to the bathroom. It’s sort of like playing poker with your dad. You lose all your money but instead of keeping it he gives it back to you. This is hardly the way to teach someone fiscal responsibility. What’s more, if I “Jane Q. Citizen” racked up a bunch of bad debt do you think I would get such royal treatment? I think not. The fact of the matter is there is no easy, quick way for a non-corporate entity to extract him (or her)self from the red. 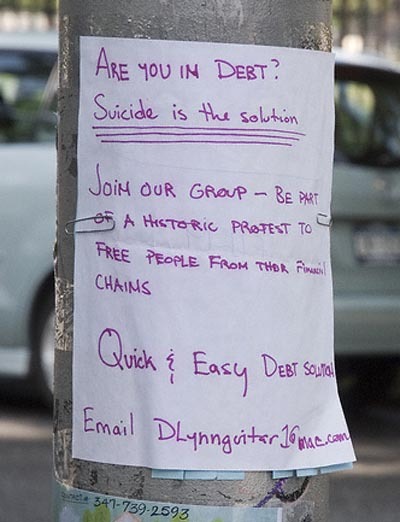 This interesting business proposition was found by Greenpoint’s very own mihow last weekend at McCarren Park. I can’t honestly say I find this solution very palatable (while effective, it is a little too permanent for my taste), but to each their own. P.S. : You can see the original uncropped photograph by clicking here.